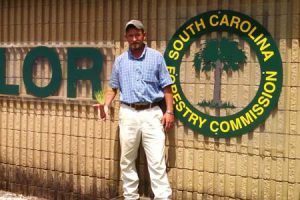 Hamp Holmes III is the new manager of the SC Forestry Commission’s Taylor Nursery near Trenton, SC. Hamp is a lifelong resident of Trenton and he came to Taylor Nursery after 14 years of working in commercial nursery production, most recently with Costa Farms. Hamp began his career in the nursery industry at Taylor Nursery in 1995 as an equipment operator. Taylor Nursery provides forest tree seedlings to landowners across South Carolina for reforestation. In addition to commercial timber species, like loblolly and longleaf pines, Taylor Nursery also produces Christmas tree varieties, and a wide variety of hardwoods for wildlife and wetland habitat improvement. Seedling sales begin on July 1.